Free coffee and breakfast snacks are provided at the departure point through the kind generosity of the Smith County Chamber of Commerce. A riders’ briefing is held by a designated “Trail Boss” at the departure point at 5:30AM. Riders must then sign in (a pre-printed check-in sheet is available for pre-registered riders) to receive their entry ticket and a hi-viz streamer to identify themselves to other riders out on the road. Riders are free to head out once the briefing concludes and they have their ticket. Co-riders who wish to get a patch and/or be included on the finishers’ roll must register by name before departure. Smackdab is 675 miles long, but it is neither challenging to ride nor difficult to navigate. The route is smoothly paved and well maintained throughout. U.S. Route 281 makes up 95% of the distance, except for the first mile and last 34 miles. It is mostly rural two-lane, with a couple of stretches of four-lane divided highway in southern Nebraska. There are few curvy sections; be prepared for a lot of straight-line cruising. Fortunately, traffic congestion is largely not an issue. Explore a detailed, interactive map of the route at Google MyMaps. Speed limits vary from 55-65 MPH. With over sixteen hours to complete the trip, there is no need to exceed the posted speeds, even when taking fairly leisurely stops for gas, food, and perhaps even a bit of sightseeing. Smackdab is not a race. Elapsed times are not recorded. Relax, be safe, and enjoy your surroundings. The only potential concern on the trip is the availability of fuel for bikes that have small fuel tanks. 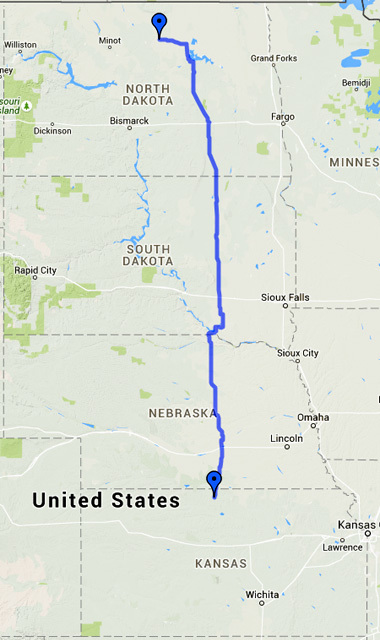 In several stretches of North Dakota, it would be wise for riders whose bikes have a range under 120-130 miles per tank or that require high octane fuel to fill up whenever available. Riders usually begin to gather at the monument in Rugby around 9 PM, and gather for a group photo as the sun sets, between 9:30–9:45. The Trail Boss will be available to validate riders’ tickets during this time. Normally, the Trail Boss validates riders’ tickets at day’s end. However, we’re aware that some participants who complete the run early choose not to stay in Rugby to participate in the sunset meet-up and group photo. (Even though we really, really think you should—sharing the accomplishment is half the fun!) Likewise, riders who arrive just prior to the 10:27 PM cutoff may not find the Trail Boss at the monument. And, of course, some unforeseen issue could always prevent the Trail Boss from completing the trip. Be dated and time-stamped between 4PM* and 10:30PM the day of the run. Include the business name and/or Rugby address. *If your receipt is from earlier than 4PM, you’re either trying to pull something shady, or you stupidly used Route 281 as a public racetrack. I will not have Smackdab turned into any sort of race or time trial. There will never be any Smackdab speed records, official or unofficial. Got it? Relax, be safe and enjoy the ride. After filling out the return address and other requested information on the validated ticket, mail it with the appropriate payment to the address provided on the participant ticket. Co-riders are eligible for their own patch only if they were properly registered and received their own ticket. You will receive your patch(s) within 3–4 weeks. Patches are made available at the cost of manufacturing, without any additional mark-up. Orders for patches arriving more than six months after the event will be honored at the discretion of the organizers. The International Peace Garden (www.peacegarden.com) is located less than an hour north of Rugby and is well worth visiting. This unique and remarkable attraction is nestled in rugged, picturesque hills unlike anything seen along the Smackdab route. It makes a great side trip after you depart Rugby on Sunday, and you’ll likely run into some other Smackdabbers there.